but what about the accountability? Don Chaney just wants to know where his money is going. But to find out, he’s had to take his Roseville homeowners association to court. And in doing so, his fight for information has become much bigger than the $126 he pays in annual fees. It’s now a fight on behalf of the one in four Californians who live within a common-interest residential development, and against the state’s 36,000 homeowners associations and the massive amounts of power and cash they control, largely out of their members’ view. Chaney’s court case may help redefine how the bulk of California’s ticky-tacky suburbs are run. At the same time, two proposed laws making their way to floor votes in the Legislature would do much the same thing. An Assembly bill, sponsored by Dave Jones, D-Sacramento, outlines more clearly what kinds of financial documents homeowners associations would be required to cough up if a member requests them, and also specifies that a homeowner can take an association to small-claims court rather than the more costly Superior Court. A second effort, by Senator Denise Ducheny, D-San Diego, seeks to restrict how homeowners associations are able to foreclose on a home. two in their Roseville retirement community. The proposed changes to state law, which would affect some 9 million Californians, were spearheaded by an unlikely group: retirees. Senator Denise Ducheny's Senate Bill 137 is scheduled for a hearing in the Assembly's Appropriations Committee next Wednesday, August 17. Also, seniors have the time to pay attention to their community boards. Take Chaney, a 75-year-old retiree, and his neighbor Ken Beer, 72, who have been trying for years--to little avail--to get their homeowners board to show them financial documents such as accounting books, canceled checks and purchase orders. They want to know how their money is being spent. “The only oversight to the board are members. There is no other oversight,” said Chaney, who spent 40 years working as a procurement manager. 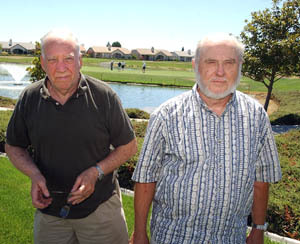 The two men live in Sun City Roseville, a retirement community of 3,110 homes for residents age 55 or older that offers two golf courses, a community center with a swimming pool, a computer cafe and a full-service restaurant. “It’s a beautiful place to live--you can see that it is,” Chaney said. The neighborhood is governed by a group of seven elected homeowners, who, like association boards throughout the state, have substantial power--to assess fees, increase homeowners’ dues by up to 20 percent a year and even foreclose on a home in order to collect on unpaid bills. The Sun City Roseville board currently collects $126 annually from each homeowner, which it uses to run and maintain the community’s common areas. Homeowners throughout the state live in similar communities, in which they elect their neighbors to govern their neighborhoods, writing rules about everything from the color of exterior house paint to the level of noise allowed at a given hour or the way trash is collected. Association boards tread the line between operating like local governments and operating like corporations. They perform many functions similar to a city council, but they operate, financially, more like private companies--which means largely in secret. Statewide they control an estimated $6 billion in cash, Murray said. “The question is whether we treat them like little governments or we treat them like private clubs,” said Chris Shultz, a spokesman for Assemblyman Jones. Beer, a self-described liberal New Yorker, began asking about Sun City Roseville’s finances out of simple curiosity. In 1998, just months after he moved in, he saw three new computers delivered to the association. Beer works with computers, knows a thing or two about how much they should cost and wanted to know if his association had gotten a good deal. Beer couldn’t get a straight answer. That set off a now seven-year-long struggle to look at a variety of the association’s purchasing orders and other financial documents. During that time, Beer, Chaney and other residents have gathered bits of information that make them more suspicious: out-of-date and refurbished two-way radios they believe were purchased at more than four times what they should have cost, air-conditioning thermostats they say were bought at a 200-percent markup, and an unnecessary mosquito-abatement program for which the association was paying $18,000 a year. Chaney believes someone is pocketing money and that the board is looking the other way. So, in May 2004, Chaney requested to review a year’s worth of invoices submitted by the association’s purchasing agent. The idea was to take a sample of the equipment and supplies purchased by the agent and see if the association could have gotten better deals. Chaney got nowhere with his request, so in February he took it to court. Sun City Roseville Community Association Board President Jim Viele did not return a phone call from SN&R seeking comment for this article. Murray compared the association to a city council, which by law is accountable to its constituents and must be transparent about its dealings. “It’s like another form of local government, but without the openness we’ve come to expect from local government,” Murray said. But Oliver Burford cautions not to compare a homeowner association with government. “Don’t get into the government thing--that’s a whole different set of rules,” said Burford, executive director of ECHO--the Executive Council of Homeowners--a Bay Area organization that lobbies on behalf of homeowners associations. Burford acknowledged that oftentimes an association performs functions similar to those of a city council, “but that doesn’t make it a government,” he said. Shultz counters that if associations have government-like authority, then they should have government-like accountability. Ducheny’s Senate bill attempts to make the foreclosure process stricter. In a handful of cases, homeowners associations have sold homes out from under their owners in order to force payment of small amounts of money. In one widely publicized case from Calaveras County, Thomas and Anita Radcliff failed to pay a $120 annual assessment. Their $285,000 home was then auctioned off for $70,000 in order to collect. But lobbyists for homeowners associations argue that foreclosure is a tool that associations need, in a rare cases, to force payment of fees. Jill Van Zeebroeck, chairwoman of the national Community Associations Institute’s California lobbying arm, questions the way Ducheny’s bill prescribes that the value for a home up for foreclosure should be appraised. Currently, an association can auction off a home for a minimum bid that is equal to the fees owed to the association and collection agency. The minimum bid on the Radcliffs’ home, for example, was $2,020. “If nothing else, we need checks and balances in place,” said Mick Macomber, an attorney who represents the Radcliffs. Macomber said a law like the one Ducheny has proposed would have prevented the foreclosure of the Radcliffs’ home. “A simple phone call would have prevented the Radcliffs’ situation,” he said. The same can be said for Willard Harrington, a Magalia man whose $68,000 home was auctioned off and sold late last year for $3,134 after he neglected to pay a $123 annual assessment to his homeowners association. Harrington didn’t realize what had happened until he was served with an eviction notice--which, as required by law, was delivered to him by a live person--and took it to friends who could read it for him, Veith said. Joe Earley, another attorney assisting Harrington, complained that foreclosure laws allow collection agencies to charge huge fees for their services. “Then, if the homeowner couldn’t pay 100 bucks or 200 bucks, they certainly can’t afford the $1,500 or $1,700 or $2,000 fees they charge,” he said. Edgar Zazueta, an aide to Ducheny, said the senator expects the foreclosure bill to pass. Governor Arnold Schwarzenegger vetoed a similar bill last year, calling it “overly broad” but acknowledging that the existing laws on common-interest-development foreclosures need clarification. An indication of the support for Jones’ bill, Assembly Bill 1098: It passed an Assembly floor vote 70 to 3. But it is currently parked on the Senate floor while Jones amends its language to mollify opponents. Meanwhile, Sun City Roseville resident Chaney has a date in Placer County small-claims court later this month, during which he will address a legal issue that A.B. 1098 would clear up. His association is arguing that Superior Court, not small-claims court, is the proper venue for this kind of document-seeking suit.